The first thing I will do for you is take a look at your website and compile an article of approximately 500 words based on the text on your website. If there is not enough information on your website, I will research the topic and write the article myself. After I have a completed article, I will "spin" it to create unique copies of the article. "Spinning" is a term that means replacing words and phrases in an article with different, synonymous words to create unique content as a result. At a glance, you will see that the article looks almost the same, but if you look closer, you will notice that 40 to 60 percent of the words are different. 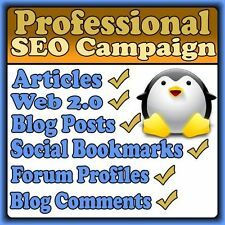 This will satisfy the search engines when your pages get crawled because Google does not like duplicate content. This article will then be submitted and approved on 100 different article websites. Each website will have a different spun version of your article, and each article page will have a backlink pointing to your website. I will then create 25 different web 2.0 properties on various Web 2.0 websites and publish another article on each one. Each article will have 1 or 2 backlinks pointing to your website and may also feature pictures and videos related to your niche within the body of the article. This makes the content look highly natural when it is crawled by Google. The next step is creating 50 wiki pages that will all include a backlink with your chosen anchor text. Each wiki page will be on a different domain and these are great sources to create strong, permanent backlinks. Having diversity in the footprint of your backlink strategy is important to ranking a website. These wiki pages are just one more unique addition to this package. This next step involves creating several hundred links pointing to your articles, web 2.0 properties and wiki pages. All of these links will use your keywords as the anchor text and will be furnished via blog commenting. Over time, this has the effect of bringing all the link juice to your website in the end. I will then create 1,000 accounts on various forums throughout the internet. With each account created, there will be a publicly viewable profile for that user account. These profiles will contain backlinks to your web 2.0 properties, article pages and wiki pages from Tier 1. Finally, for even more link juice, I will create 100 social bookmarks which will also have a backlink pointing toward your web 2.0 properties, article pages and wiki pages from Tier 1.